Denton House is a friendly B&B guest house in the Northern Fells of Cumbria. We have 7 comfortable bed and breakfast guest rooms (most en-suite) which can be let as double, single, twin or family rooms on a bed and breakfast (B&B) basis. All of our B&B rooms are spacious and most have views of the village and up to the Caldbeck Fells or over surrounding countryside. Some rooms have garden views and views up to the Caldbeck Fells, some overlook the village green. 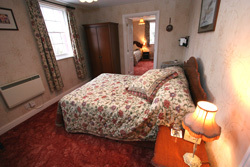 Each room has a colour TV and tea/coffee making facilities. Fresh milk available on request. 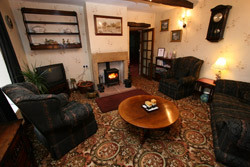 Relax in our cosy guest lounge with comfy sofas, and roaring wood burning stove. Books and games available for guest use. Full English Breakfast is served between 8am and 9am in our large breakfast room, again with roaring open fire and views over our floral garden.